JustRite is the Sponsor of this weeks CPS Sketch, grab your stamps and play along, you might just win some great products from JustRite Stampers! I used the sketch as inspiration for creating my card, but in place of the two smaller circles I added some Chocolate Satin Ribbon. I wrapped the two corners of my designer paper with Chocolate Ribbon, layering onto a piece of Soft Sky card stock, then my Chocolate base card. 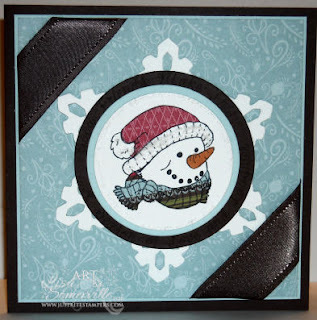 Using the Big Shot and the Snowflake Die, I cut a snowflake from White card stock, and adhered to my base card. 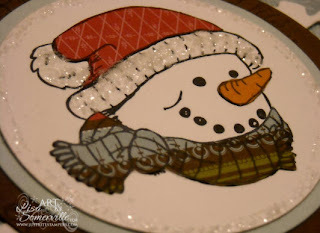 Using the 3-1/4" Wooden Stamper from JustRite and the Snowman image from Old Fashioned Christmas, I stamped my image in Black on White card stock, then cut the White panel with the Big Shot and Spellbinders Circle dies. I layered this image on Soft Sky and Chocolate Circles. I stamped the image again on patterned paper for the Hat and Scarf, and Orange card stock for the nose, then paper pieced the stamped image. After adhering to the base card, I added Ranger Rock Candy Stickles to the Hat. You are amazing - I have to stop looking and start creating myself! Love the hat&scarf! Let it snow! !